The Keysight 3458A is available to buy refurbished used or rent, usually from our UK stock. Click here to download the Keysight 3458A datasheet. The Agilent Technologies 3458A Multimeter shatters long-standing performance barriers of speed and accuracy on the production test floor, in R&D, and in the calibration lab. The 3458A is simply the fastest, most flexible, and most accurate multimeter ever offered by Agilent Technologies. In your system or on the bench, the 3458A saves you time and money with unprecedented test system throughput and accuracy, seven function measurement flexibility, and low cost of ownership. Select a reading rate of 100,000 readings per second for maximal test throughput. Or achieve highest levels of precision with up to 8.5 digits of measurement resolution and 0.1 part per million transfer accuracy. Add to this, programming compatibility through the Agilent Multimeter Language (ML) and the 3458A’s simplicity of operation and you have the ideal multimeter for your most demanding applications. 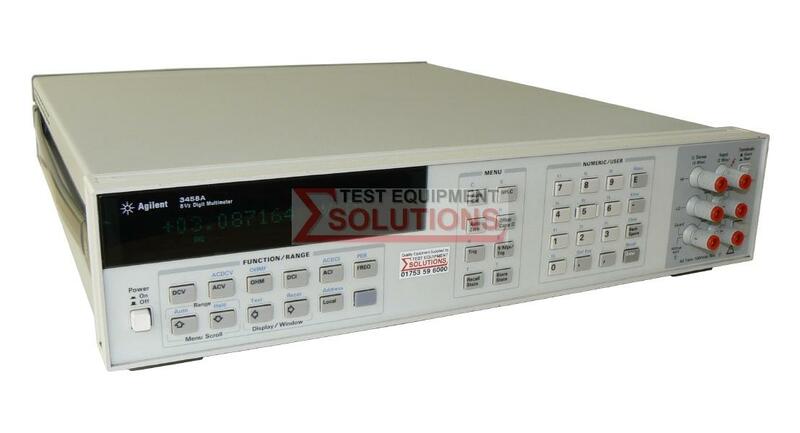 We offer the refurbished used Keysight (Agilent) 3458A 8.5 Digit System Multimeter for sale and rental. The Keysight 3458A is fully tested and refurbished in our in-house ISO9001 calibration laboratory. We supply manuals, accessories, full warranty and a free-of-charge Certificate of Conformity. We can also provide the Keysight 3458A with a fresh calibration for a small additional charge. If you have under-utilised test equipment talk to us about trading-in or part-exchanging it towards the Keysight 3458A or other refurbished test equipment.